Painting, creating jewelry and healing work all have one thing in common for me – a desire to connect to the Divine and share that experience with others. My paintings arise from an abiding respect and admiration of nature I see around me, visions received during meditation, and archetypical symbols that reappear throughout history. These paintings are an experience in connecting to my inner knowing and allowing that to guide the paintings. Often what emerges is beyond my thinking mind. Texture and light play an intricate part of my paintings and jewelry. 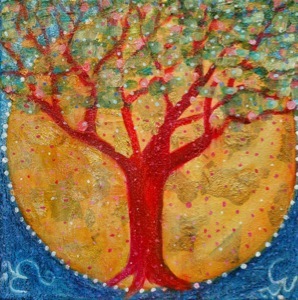 I use acrylics, handmade paper with mica, and gold foil as elements in many of my paintings. In jewelry I use semi precious stones and other specialty beads and sterling silver earring wire and fasteners. My jewelry is always created with an eye to unique color and texture combinations as well as the light within each stone. I seek to create pieces that uplift the beholder and give one a feeling of inner peace.